We have a busy year ahead of us. 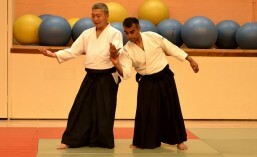 13th June Doshu Yoshigasaki will be teaching our club on the Friday evening. We are expecting students from Europe again to join us at they did last year. 14th-15th June Doshu Yoshigasaki will be teaching the weekend in Salisbury. 19th-24th July Doshu Yoshigasaki will be teaching in Denmark. We are arranging a group from our club to attend this course. 21st-23rd November Doshu Yoshigasaki will be in Burton. We are still going up to Coventry to see Shihan Burgess the second Saturday of the month. Our next visit will be 8th February. I am also in the process of arranging a weapons class to run the fourth Saturday of the month. I’l post details when these are finalised. We are still running the children’s class on Thursday from 6pm-7pm. I’ve posted earlier on the benefits of training for kids. Are regular clubs for adults, Tuesday and Wednesday in the Barbican and Thursday in Harrow are running as well. I’ll keep the site updated with more details as I get them.